Personalized Aluminum Sports Bottles in Bulk. Cheap, Promotional, FDA approved, 25 oz. Inexpensive Personalized Aluminum Sports Bottles in Bulk. Promotional, 25 oz. w/ Self-attached lid. FDA approved, BPA free. Budget Prices in the USA and Canada. Wholesale Personalized 25 Oz. Aluminum Sport Bottle on sale. We also supply blank (not custom imprinted) bulk 25 Oz. Aluminum Sport Bottles at EQP (End Quantity Price). Lowest cost in USA and Canada for promotional 25 Oz. Aluminum Sport Bottles. American clients pay no taxes. 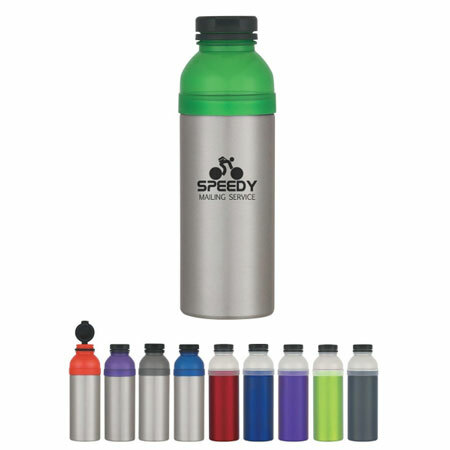 The unit prices below include your 1-color custom imprint on one side of the Aluminum Sport Bottles. Colors: Silver with Translucent: Blue, Red, Charcoal, Lime Green or Purple Top. Red, Lime Green, Purple, Charcoal or Blue with Clear Top, all with Black Lid.